How can you participate in the California Phenology Project? If one of the CPP National Parks is accessible to you, visit the Phenology in the Parks page to: learn about the CPP activities at your local National Park and which species are currently being monitored by each park; examine the species profiles that help to guide your observations; download maps and GPS coordinates of monitored plants; find instructions for volunteering at your local National Park; and learn who to contact at each park if you’d like to learn more. If none of the parks are accessible to you OR if you would like to set-up monitoring sites on a non-park property (e.g., at a natural area preserve, a state park where you are employed, or your backyard), visit the Meet the Species page to see the list of California species that are targeted for monitoring by the CPP. The CPP uses standardized phenological monitoring protocols developed by the USA National Phenology Network (USA-NPN; www.usanpn.org), and CPP observations are uploaded to the USA-NPN database via Nature’s Notebook. You can set up a monitoring site on your own and monitor CPP species at a site near you! 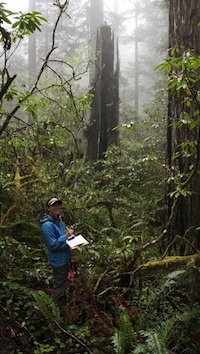 When you join the CPP network of observers, you benefit from the collective experiences of monitoring CPP taxa, you can share your experiences monitoring CPP species with other observers, and you can mentor new CPP observers in your area. To learn more about setting-up your own monitoring sites and uploading your observations to the national database, visit the Participate tab on the USA-NPN website and download the 1 page guide to observing phenology with Nature's Notebook. If you would like to attend a CPP training event to learn more about joining the CPP effort, visit the News tab to learn about upcoming CPP training events. If you are an educator, you can build a phenology garden at your school and download instructions for hand-on interactive activities to conduct in your new garden! If you are an undergraduate student, we encourage you to arrange an internship or directed study project at one of the CPP pilot parks. Visit the Phenology in the Parks page to learn about activities in each pilot park or contact the UCSB field coordinators.